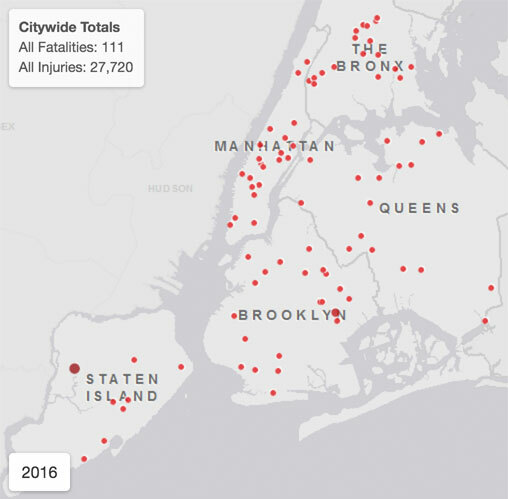 After a four-month hiatus, City Hall is again updating its Vision Zero View map with new crash data, and through the first six months of 2016, traffic deaths rose slightly compared the same period last year. Through the end of June, 111 people lost their lives to traffic violence, up from 107 in the first half of 2015. Drivers killed 58 pedestrians and 12 cyclists from January through June this year, compared to 63 pedestrians and five cyclists in the first six months of 2015. The month of June was especially deadly, with 29 fatalities, wiping out what had looked like progress in the first five months of the year. Traffic injuries, which are less prone to random variation, are also up from last year for pedestrians and cyclists, though Vision Zero View does not track injury severity. Motorists injured 7,110 people walking and biking through June, compared to 6,518 pedestrian and cyclist injuries during the same period in 2015 — an increase of 9 percent. Injuries to pedestrians rose from 4,870 to 5,214 year to year, and injuries to cyclists increased from 1,648 to 1,896. While traffic deaths declined in 2014 and 2015, at the current rate, NYC will not reach its goal of eliminating traffic deaths by 2024. To start making progress again, City Hall will have to overhaul dangerous streets with greater urgency. But this year Mayor de Blasio declined the City Council’s request to increase funding for street redesigns to prevent serious collisions. Earlier this month, Transportation Alternatives Executive Director Paul Steely White called on de Blasio to prioritize spending on life-saving street redesigns, such as protected bike lanes and split-phase traffic signals. The map now has fresh data, but the front end looks and functions the same as before. The mayor’s office told Streetsblog the new crash reporting system will eventually make it possible to improve functionality and provide more timely data updates. So…as the NYPD started writing MORE tickets to cyclists, the number of deaths increased…. And yet DeBlasio and Trottenberg REFUSE more money for Vision Zero?!? Human beings are literally dying. Year 1 of Vision Zero was about introducing New Yorkers to the concept of ending traffic violence and scoring some big wins, such as the 25 mph speed limit. Year 2 was ideally about building on those wins, looking for other policy changes such as the ROW law, and setting in motion design changes that would really pay off down the line. So Year 3 of Vision Zero should be when it’s seeing its biggest successes, right? Yet here we are. Advocates need to disconnect Vision Zero from any and all associations with Bill de Blasio. That’s the only way to guarantee that it can be rebooted if he loses the next election, which, by all rights, he should. The irony will be that when he does, he’ll no longer have to be driven to the Park Slope YMCA. If more money would buy either of them an actual understanding of what makes Vision Zero different than the status quo US road safety campaigns or buy BdB a spine to stand up to the Community Boards and Bratton on making life-saving infrastructure changes, then I’d be all for it. Otherwise, this half-hearted little marketing campaign needs no more money thrown at it. (And I say this as an active TA member who spent a day going to Albany for speed cameras, but would not walk a few blocks to City Hall to campaign for more funding for Vision Zero specifically because I do not agree with the version we’re implementing in NYC). AFAIK the money was specifically earmarked for design changes. The question I’ve had about it is whether it could be used to improve designs that are already happening, like adding QUIK CURB to a curbside buffered bike lane. I would bet that the number of actual distracted drivers continues to increase each year, as people who have now been addicted to responding to every beep, every ping of their phone within 1.3 seconds, ‘come of age’ and obtain their drivers license.